For over a year now I haven't been able to read as much as I would have liked to, which has made me pretty sad. Thankfully over the last few months, my reading has picked up a bit more (as I now have slightly more time to read). Since June, I've read Chewing Gum, Where to Now, We Need New Names, the Aya Series, Americanah and London Cape Town Joburg. 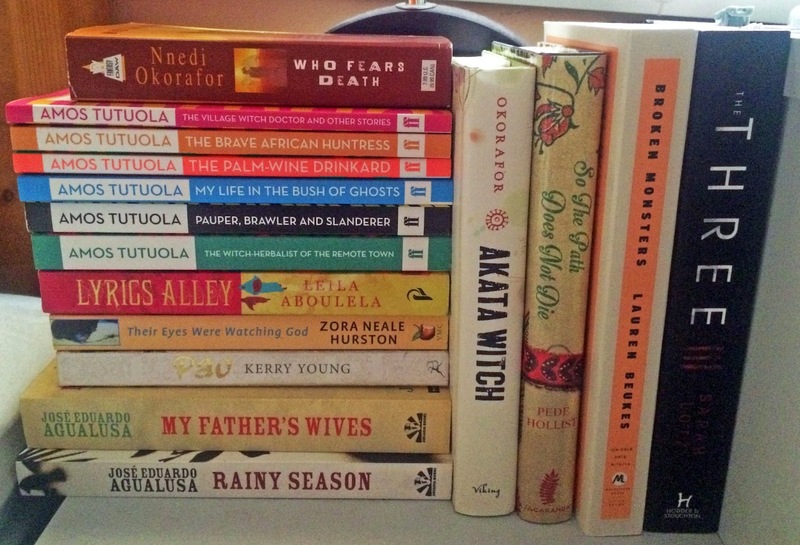 I've also been doing some reading in the non-African lit world - Gone Girl, The Twelve Tribes of Hattie Smith, Seraphina, Volume 1 of the Saga Series and Catching Fire (and started reading Mocking Jay). I've also started reading The Three (so far, so awesome). Although I've been doing a lot more reading, I've also noticed I've been doing a lot less reviewing - which I am really trying to rectify. I found Jose Eduardo Agualusa's My Father's Wives and Rainy Season at the Southbank Book Market. The day I got it I didn't have enough cash on me and the lady selling the books was kind enough to put them in a safe place for me for a few hours. I headed back there on my way home and it was still there. Kerry Young's Pao and Leila Abouela's Lyrics Alley I got from Church Street Bookshop in Stoke Newington. I ended up getting Nnedi Okorafor's Who Fears Death and Akata Witch via Amazon as I can't seem to find her earlier novels here in the UK (or maybe I'm not looking hard enough). They are both second hand and in excellent condition. Amos Tutuola's novels I got courtesy of Faber & Faber, while So the Path Does Not Die by Pede Hollist I got unexpectedly yesterday from Jacaranda who were at the African Fashion Week London. The Three is my most recent purchase - I got that last week at the airport during the longest layover ever. I tried to continue reading it as I sat on the plane waiting to take off until I decided that reading it on a plane probably wasn't the best idea. Finally, I've started getting more and more interested in Caribbean literature and want to start to read more of it. My mum's got a ton of Caryl Phillips (I think she might have everything he has ever written) and I recently got Kerry Young's Pao. 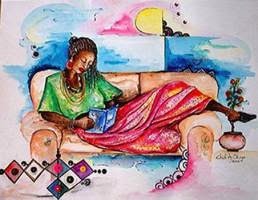 But I need your help - if there are any readers and lovers of Caribbean lit out there, I would really really really love if you could recommend me a few books to read. Classic ones. More newer ones. The must-reads. I know very little about it, so your recommendations are much appreciated. Thank you!!! What a lovely pile of new books! I really enjoyed Agualusa's The Book of the Chameleons, so I'd like to read more of his books. 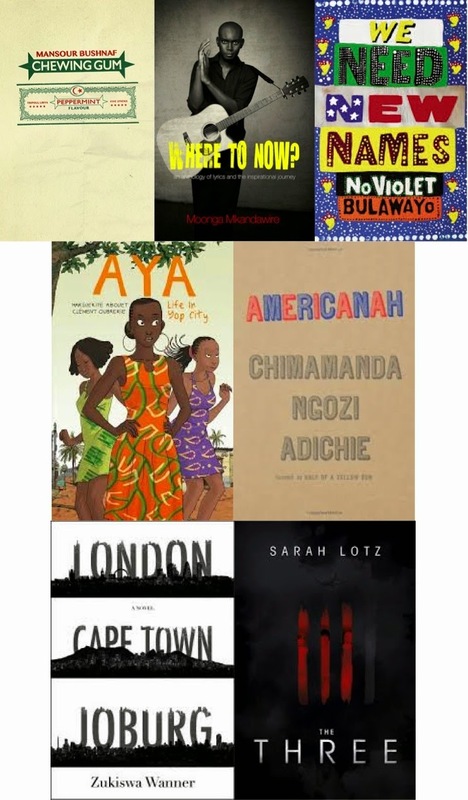 For Caribbean books, I second the recommendations for Danticat and Kincaid. I also really love Julia Alvarez's books, especially In the Time of the Butterflies. Miguel Street and The Mystic Masseur by VS Naipaul. Oh, a wonderful blog about books, lots of books. Love it! Since everyone will recommend Caribbean books written in English, I'll head then to different islands: Guadeloupe and Martinique. I recommend Partick Chamoiseau, Gissle Pineau, Glissant and Maryse Conde. For classic non-fiction - The Black Jacobins by CLR James is the best ever! Happy reading. Ah thank you so so much. I am very excited with all these wonderful recommendations :).